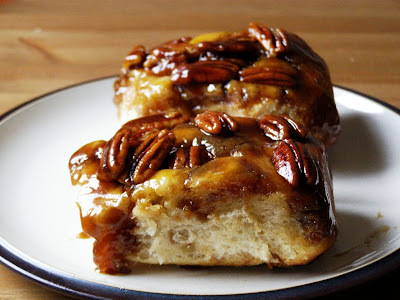 I saw this recipe for sticky buns, which were cinnamon rolls baked in a tray of sticky toffee sauce with pecans and had to try it. The bun recipe wasn't vegan so just used my cinnamon roll recipe but doubled it to fit the whole tray. The filling and topping ingredients were vegan anyway. They turned out fantastic, was quite worried when it came to getting them out as you turn the whole pan over but they all came out together with almost all the sauce and pecans. Altogether easy and delicious! 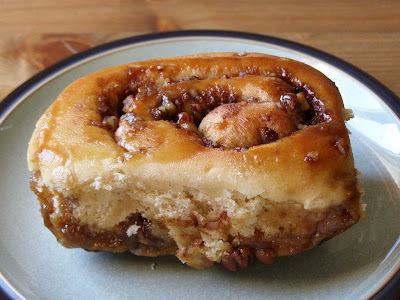 For the buns, sorry but I've got a nasty cold and have no energy so I'm redirecting you to my link above for the cinnamon buns - just double it. After the first rising of the dough, punch down and roll out on a floured surface into a 15" x 10" rectangle. Spread with the margarine then after mixing the pecans, brown sugar and cinnamon, sprinkle all over. Starting at the long side, roll up tightly, pinching the seams to seal. Cut into 15 pieces. For the topping, bring the brown sugar and margarine to a boil in a saucepan, stirring constantly - you may have to whisk at one point. Remove from heat and stir in the corn syrup. Pour into a 13" x 9" non-stick pan. Place the rolls in the pan in 5 x 3 rows, lightly cover with cling film and leave to rise for 1 hour. Preheat oven to 350/180C and bake for about 15 minutes or until golden brown on top. Leave in the pan for 3 minutes then on a wire rack lined with baking paper carefully turn the pan over onto it and tap the bottom a few times. It should all just come out easily. I also ran a plastic spatula around the edges first to make sure. Leave to cool although they are best still warm with a cup of coffee. Also, it may be a good idea to separate these while still warm, might get a bit sticky later. For the next day they are best heated up in the microwave for about 30 seconds. Anything I could replace the corn syrup with? maple or agave maybe?